wonderful to be back in the intellects and back here to share the sacred joys, the blessings and the evolving energies of the ancient mother india with each of you! below is the inner resonance of words of a pruned mind and above is the realms of the spirit rejoicing in the lamp of being the spirit- bringing these two worlds as one in each breath is the tantric wisdom. when the blossoming has found the seed to be seedless is the evolving grace that we seek, we seek within through the mula, the root that is defined as the animal past present in the evolving human body we are with right now and the elephant of senses ascending in its awakenings! ganapathy as in visual form leading to the blossoming of the four petals in each of our perceptive mind directions. awakening as two thoughts, the mind and the thought, then finding the trinity to merge in the fixed glance above. the sound ‘aym’… the sound of sacred human intellect expanding into higher consciousness of turiya, the awakened that witnesses several awakenings of carefully birthed new thoughts and yet, in joy of possessing the body! yoga in its silent expression of spirit with its body roots. sensuality is a gift received for the primal human to find the eternal womb and then just as sleep’s temporary shield of maya pierced in awakening to experience turiya, accompanied by the tumo, the eternal fire that the body is in, seek! the tantric joys that is with the cosmic dance rising from each inhale with the ignite mula as the supreme energies transcending the body beyond limits. lifting the tongue above, as the the joy of sucking the higher realms of brilliant brightness, perch the river of the sacred sound, between the eyebrows. the dance of ‘nada’ is the experience that transcends sound to light and threshold realms of being free to Be. inhaled breath back into the muladhara, the sacred roots in fire of body lifted above the navel. the navel cave of the guru. the passage to this cave, the evolving grace received so in human fulfilled for the mind to bend inward. the conserving energies of this tantra the grace of surrender to hold the sacred void and the awareness of each breath lifted above the navel. the sacred guru who is entwined as our intellect that keeps spine upright so the spirit is as aflame in the body that transcends. grace flow from each of our breath as sacred essence and the pilgrimage of many completions to find and dissolve. blessings that evolve in its fulfilling grace! this photo (above) was taken during our pilgrimage as we went deep through the forest climbing above to the sacred realms of the beings of light, where the ancient primal goddess is being worshipped. 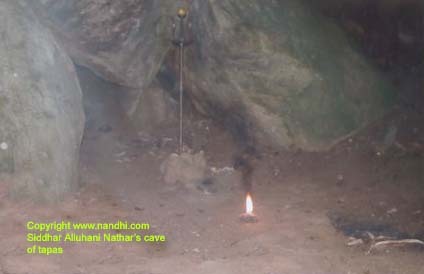 the sacred picture is of a siddhar’s cave in which for several years, this light-being must have lived as in a body thriving on sunlight and water deep in the forest- as spirit with control over the elements of nature and the body. cheers to being the spirit and spirit in each of us! 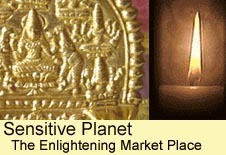 Sensitive Planet– www.sensitiveplanet.com An Enlightening Marketplace!